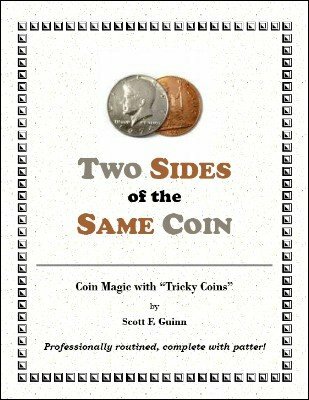 Three powerful coin magic routines with "tricky coins"--professionally routined, complete with patter! Easy of execution, but strong and commercial! Scott has held nothing back: the routines are masterfully explained, profusely photo-illustrated, and include all the subtleties and nuances, along with complete, professional performance scripts! The three effects can be performed one right after the other to form an entire coin set--in fact, that's exactly how Scott performs them. There is good variety between the routines, and audiences absolutely love all three. Kung-Fooled - a twisted take on the Thieves and Sheep plot, with a surprising (yet logical) finish! Simplex Multiple Spellbound - Do you like the Spellbound effect? Well how does THIS grab you: FOUR silver coins change to FOUR copper coins with no false moves and both hands are completely clean! Then the FOUR copper coins magically change to FOUR Chinese Coins! You end totally clean--everything may be examined! Many Happy Returns - A half dollar visibly and instantly multiplies to three half dollars! Then a quarter and a dime appear, magically, visually, and very cleanly. All but one of the coins suddenly vanish, and that last coin VISIBLY turns into a JUMBO (3 inch) coin in the PARTICIPANT'S HAND! Once again, you end C-L-E-A-N! 34 pages, 33 photos/illustrations, complete professional performance scripts! 1st edition 2010; 34 pages.